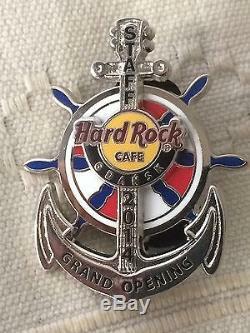 Hard Rock Cafe Gdansk Grand Opening Staff Pin. A great addition to your collection or a wonderful gift item. Pin is in new condition. All Pictures are of the actual pin that you will receive. If you are NOT Happy with your item for any reasons. The item "Hard Rock Cafe Gdansk Grand Opening Staff Pin LE 100" is in sale since Tuesday, February 10, 2015. This item is in the category "Entertainment Memorabilia\Music Memorabilia\Rock & Pop\Artists H\Hard Rock Café\Pins". The seller is "pandakris" and is located in default, default. This item can be shipped worldwide.